I was so inspired and impressed by the people who organized and participated in the wilderness conference that I felt compelled to write about the moments that moved me the most. The wilderness “Woodstock” was as pivotal a gathering to the wilderness movement as the rock concert was to the sixties. And I want the world to know about it because we all need the wild. Not just the 1,500 wilderness lovers like myself that made it to the conference. The wild lands so close to Albuquerque also got my attention. Having only visited Santa Fe once, I didn’t realize the vast areas of desert, river and mountains that are protected forever across the state. I was thrilled by the view while hiking in the Sandia Mountains and mesmerized by the conservation at the nearby wildlife refuge. I could have spent the whole week exploring and hope to come back. After most conferences, we tend to all leave and go back to our lives and work. This was too important. So I wrote this article and several versions of it that were published in the Green Fire Times, the local newspaper where I live – The Sonoma Valley Sun – and in several Sierra Club publications. It’s my way of getting the word out about wilderness. I hope it inspires others to think more about the wild and to get out there and enjoy it, too. And to do what you can to help protect the wild places that you love. President Jimmy Carter in a videotaped address reminded us of the important scientific, ecological, educational, recreational, spiritual, cultural and intrinsic values of wilderness to all Americans. He also urged action on the iconic wilderness areas that were proposed but never designated inside places as iconic as the Grand Canyon, Yellowstone, and Glacier National Parks. Only Congress can designate wilderness through federal legislation. The Wilderness Act has successfully protected 110 million acres of public land in the U.S. as designated wilderness since it was enacted in 1964. But at least another 200 million acres of “forgotten” wilderness that qualify remain at risk inside national parks, refuges, forests and other public lands, as Carter mentioned above. In other highlights, U.S. Department of Interior Secretary Sally Jewell recounted recent backpacking trips and astronaut Joseph Acaba gave us glimpse of life in outerspace. I asked how we might protect wilderness in space as it gets increasingly commercialized. Throughout the conference, wilderness advocates, Native Americans, natural resource managers, land stewards, academics and politicians shared compelling perspectives on wilderness successes, threats and challenges ahead. The program featured stimulating keynote speakers, panel discussions, workshops, trainings and field trips to the nearby desert, mountains and rusty Rio Grande. Many of us visiting from outside New Mexico learned the word “bosque” for the first time as we observed tall cottonwoods along the Rio Grande peaking in yellow and sand hill cranes landing for the winter. Before the conference, I hiked with two new wilderness friends into the Sandia Mountains Wilderness on the edge of Albuerque. We climbed to South Sandia Peak where the city and desert sprawled forever below us. The next day, about a dozen of us boarded a bus to tour the nation’s first “urban” wildlife refuge at Valle del Oro, where plans to restore the farm are now underway. Then we traveled to Servietta where cactus were starting to bloom. The van then struggled up the rock and sand track into the narrows of San Lorenzo Canyon. There we jumped out to walk the shade of rock and ancient sandstone formations. Last, we entered the wetlands of Bosque Del Apache that hosts the annual Festival of the Cranes. The wildlife management regime that keeps this place “wild” is amazing for its success. A muskrat swimming in one of the channels was one sign. As the conference got underway, one of the most memorable moments was when Dave Foreman told how a musk ox charged and chased him across the Alaskan tundra on a recent expedition. Now that’s wild! Foreman called for protection of 200 million acres of “forgotten” wilderness that remain at risk in places as iconic as the Grand Canyon, Yellowstone and Glacier National Parks, also mentioned by President Carter. Proposals to protect these cherished national wild lands have languished for more than 30 years. Utah-based author Terry Tempest Williams moved many of us to tears with her powerful testament to wilderness. She asked “How serious are we?” about protecting wilderness as she catalogued the rising threats to wild lands from fracking, mining and oil drilling. World famous oceanographer Sylvia Earle wowed the wilderness crowd with her impassioned call for blue wilderness in our oceans. A hero to many and sometimes called “Her Deepness,” Earle showed amazing underwater photos as she spoke eloquently and passionately for conservation of sea life and underwater wilderness. Later a panel discussed marine wilderness and suggested that the Wilderness Act may be a legal mechanism for designating ocean wilderness. I hope that Earle’s vision sparked the beginning of a beautiful friendship between the land and sea wilderness movements. After backpacking in the Sierra Nevada for nearly two decades, I finally through-hiked the John Muir Trail (JMT) this year in honor of the 50th anniversary of the Wilderness Act. I usually go on organized Sierra Club trips as a leader or participant with the San Francisco Bay Chapter Backpack section, but this time I was going solo. The JMT is an epic, 211-mile path through the Sierra Nevada Mountains from Yosemite to Mount Whitney—the tallest peak in the lower 48 states. The Trail winds through four magnificent wilderness areas: Yosemite, Ansel Adams, John Muir and Sequoia-Kings Canyon Wilderness. It took me 21 days to cover 185 of the 211-mile JMT, starting in Tuolumne Meadows on July 7 and summiting Mount Whitney on July 27. As part of my personal JMT challenge, I raised funds to support the trip and wilderness protection in California through a crowd-sourcing campaign. I was thrilled to present a $1,000 check to Sierra Club’s wilderness maven Vicky Hoover at the National Wilderness Conference at a gathering of Sierra Club wilderness activists. With Vicky’s leadership, the Sierra Club helped spearhead the jam-packed wilderness marathon. The donation will go to the CA/NV Wilderness Committee. Any Sierra Nevada backpacker knows that afternoon thunder showers are normal. But this July, unusual monsoon weather dumped rain, hail and even snow on the high peaks. It was my 14th day on the John Muir Trail when an early morning snowstorm hit as I climbed up 12,130-foot Pinchot mountain pass. As thunder and lightning intensified, I crouched down next to a boulder and tree for safety to figure out my next move: turn back, sit it out, or keep going? Thankfully, a group of hikers soon came up the trail behind me, and together we chanced it to the top and over. Later I learned that anyone who was on a high pass that morning was pelted by snow—and survived. But the bad weather sent many folks home. I trekked on, donning rain gear or hunkering down in my tent during rain and hail. And when the sun shone, I dipped into an alpine lake or stream and sprawled across warm granite to dry. Finally, I reached 13,152-foot Forester Pass, highest pass on the Muir Trail and the last obstacle before Mt. Whitney and home. Then suddenly, smoke. Hikers coming down the mountain had seen trees going up in flames. First snow, now fire! Fortunately, the small blaze died down, though the smell of smoke lingered in camp below the pass all night. After a tough climb up and over Forester followed by the rocky ascent of Mt. Whitney a few days later, I splashed my way down to Whitney Portal and a warm hotel bed. The JMT adventure seemed long ago by the time of the wilderness conference. Most wilderness leaders agreed that wilderness is more important than ever, but that wilderness places and the idea of wilderness are more vulnerable than ever. Not only is wilderness threatened by extractive industries and motorized recreation, but many seasoned wilderness warriors warned that the very notion of wilderness is under attack by those who think that the wild has no place in the modern world. Even worse, natural resource agencies are marring wilderness by using heavy equipment and trammeling the landscape. “The greatest violators of the Wilderness Act are the public agencies themselves,” said Louise Lasley, president of Wilderness Watch, citing how agencies are too quick to make exceptions for the use of chain saws and trucks in wilderness. Barns accused NGOs of being complicit and wanting to make wilderness “palatable” to everyone in order to maintain alliances with special interests and the public. Most Americans love the idea of wilderness, said George Nickas, Executive Director of Wilderness Watch. He and others concluded that we need to reignite America’s passion for wilderness. As Kenneth Brower stated, we need to “re-sell” the idea of wilderness to Americans, like his father David Brower did 50 years ago in partnership with Howard Zahniser. The wilderness movement must now mobilize young people to watchdog the Wilderness Act for the next 50 years. As a first step, 14 young activists were given full scholarships to attend the wilderness conference. And many more participated in the Wilderness Youth Leader Summit. At the end of 2014, more 244,000 acres of wilderness in Colorado, Montana, New Mexico, Nevada and Washington were designated as Defense Authorization Act. The New Mexico Wilderness Alliance and its coalition partners achieved new wilderness designations in the Columbine Hondo Wilderness as part of the bill. Earlier in another bill, the group won new designation in the Organ Mountains-Desert Peaks National Monuments. The Alliance has been successful due to its community organizing in the communities next to the wilderness areas. In California, new wilderness bills are pending to protect more lands in Northern California, the Central coast and in the desert. President Obama is calling for long overdue wilderness protection for the Arctic National Wildlife Refuge. The president has also named 13 national monuments so far using the century-old Antiquities Act, adding new protections to more than 1 million acres of public land. In California, we are hoping he will soon designate the Berryessa-Snow Mountain Wilderness monument, located northeast of San Francisco in a rugged range that towers above Napa Valley. To reinvigorate the wilderness idea in America, we must remind our friends, families, allies, and decision makers about the many benefits of wilderness protection. And mobilize them to support wilderness through organizing, letter writing, Social Media and just getting out into the wild. As Ed Abbey said, wilderness needs no defense, only more defenders. 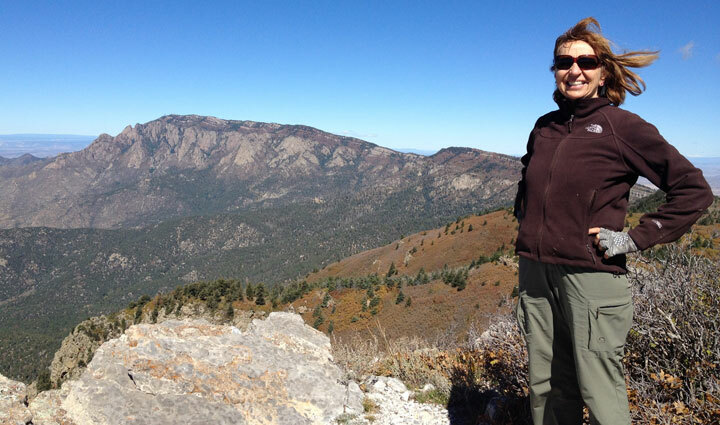 Teri Shore is an avid backpacker and wilderness advocate who has led Sierra Club backpack trips for the San Francisco Bay Chapter Backpack Section since 1996. As a writer and journalist, she publishes stories of her experiences in print and online media. She adores Yosemite, the Sierra Nevada and Trinity Alps. She has climbed Mt. Shasta and many non-technical Sierra peaks over 9,000 feet including Mt. Conness, Mt. Dana, and Mt. Hoffman. She has also completed long treks in Australia, New Zealand and Canada. Shore has lived in Sonoma, Calif., for 25 years. All images in this post were contributed by Teri Shore, 2015. Home page: Sandia Wilderness 50 hike, 2014. Blogpost/Main feature, left to right: Dave Foreman, Co Founder Earth First and Teri Shore and Friends, 2014 Sandia Mountain Wilderness 50 Hike – left to right Teri Shore, Claire Muller, Lead Wilderness Steward The Selway-Bitterroot Frank Church Foundation and Suzanne Cable, Assistant District Ranger for Recreation & Wilderness, Districts, Superior National Forest. Inspiring article by Teri Shore. I had no idea of the scope of wilderness areas available and the millions more in jeopardy. Thank you for your perspective and advocacy. Thanks so much for the comment. We are glad that you were inspired by Teri’s article and looked into the helpful resources she included. We are so glad that Teri is one of our featured Wilderness Thinkers an will pass-on your feedback to her!